The second stop on my cruise on the Azamara Quest was at Kusadasi, Turkey; which is also the gateway to the ancient city of Ephesus. It was much different than the previous days stop at Patmos, Greece and much busier. We docked at Kusadasi, went exploring in Ephesus and then went back for an AzAmazing Evening. Kusadasi is a bustling port town that has been built on the cruise ship industry and its relative proximity to Ephesus. Kusadasi itself is OK. It looks nice from afar, from the ship, and around the edges-especially looking at gorgeous Pigeon Island. However, once you get past all the port shops trying to sell you jewelry and clothes; you enter the old city and bazaar. There are literally thousands of peddlers selling everything imaginable-even genuine fake watches!!! 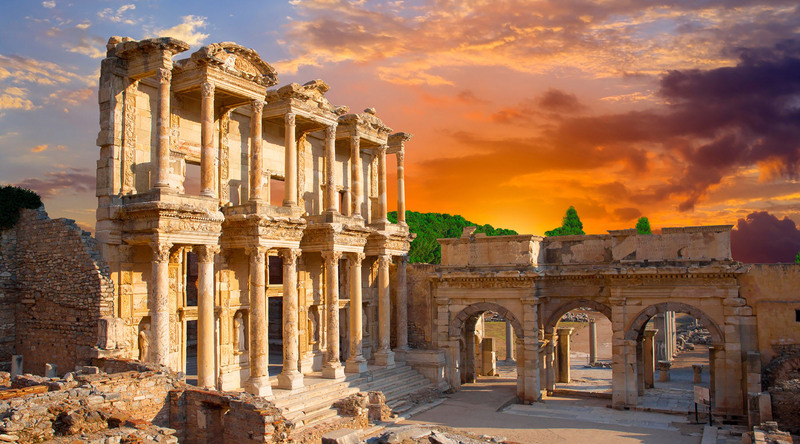 So if you’re a shopper, which I am not, you might love Kusadasi, but Kusadasi’s purpose is to get you to Ephesus and that’s exactly what I did! Ephesus is, in a word, awesome. I was previously there in March 2001 during my first trip to Turkey. I have since been ten (ish) times but this was first time back at Ephesus and I have to say it was much more awesome than I remembered. Perhaps it’s that I’ve grown up (a little) and can appreciate places like Ephesus more and put it into proper historical perspective. The weather wasn’t very cooperative with us on this day but that didn’t stop a thorough day of exploring the site. The Terrace Houses, the Library and the Amphitheater were easily my favorite sites and I was able to get some nice pictures. The one thing I didn’t remember at all from my prior visit was how many cats are all over Ephesus. There are literally thousands of them. The cats aren’t really a nuisance but there are just so many of them that you certainly are aware of them. Some tourists loved them and some loathed them. I was indifferent but enjoyed watching others interact with the cats! After Ephesus, it was back to the ship to relax a little before the AzAmazing Evening. It was originally supposed to take place at the Odeon Amphitheater outdoors in Ephesus itself but the rain and cold weather made that a no-go. So luckily they moved it to a very cool venue in the nearby town of Selcuk. They have a 1/10th replica of the original Temple of Artemis; which was one of the original 7 wonders of the ancient world. It was pretty cool to see and to experience the AzAmazing Evening of classical music inside from a renowned Turkish orchestra. I enjoy classical music and what’s great about the AzAmazing Evening in Ephesus and the previous one I experienced in Livorno, Italy in an opera house was they play songs you know or have at least heard before. This way, even if you’re not a huge classical or opera music fan; which I admittedly am not-you can still enjoy it! So, it was a great day from Kusadasi to Ephesus to the AzAmazing Evening of classical music. I can’t wait to continue the cruise tomorrow!